The late senator, who was once considered a vice presidential prospect, tried to prevent the GOP’s lurch to the right. The passing of former Massachusetts Senator Edward Brooke III, at age 95, gave obituary writers and political commentators a rare opportunity—perhaps one of the last—to put together the words “liberal Republican.” Brooke, who served as attorney general of Massachusetts before becoming the first African-American elected to the US Senate by a popular vote, was an epic figure in the politics of the 1960s and 1970s. With his ardent support for civil rights, faith in the ability of an active and engaged government to address economic and social challenges, and deep skepticism about the Vietnam War, he took the lead in a liberal Republican vanguard that included New York Mayor John Lindsay, New York Governor Nelson Rockefeller, New York Senator Jacob Javits, Michigan Governor George Romney, Maryland Senator Charles “Mac” Mathias, Michigan Congressman Don Riegle Jr., Oregon Senator Mark Hatfield, New Jersey Senator Clifford Case, New Jersey Congresswoman Millicent Fenwick, California Congressman Pete McCloskey and a young Ripon Society activist, Wisconsin legislator and future congressman named Tom Petri. The list of liberal—or at least liberal-leaning “moderates”—in the Republican Party was once long and diverse. But as the party has veered further and further to the right, even politically engaged Americans have begun to forgot how influential those liberals were, and how close some of them came to changing their direction of their party and the course of history. Brooke offers a remarkable reminder of what might have been. Elected to the Senate in 1966, he was featured on the cover of Time magazine and the front page of The New York Times. He rose immediately to a position of great prominence in a party that was proud of its anti-slavery and anti-segregationist roots. Brooke was a speaker at the 1968 Republican National Convention, where he was speculated about as a potential vice presidential nominee. Later, he was offered a cabinet post and a nomination to serve on the Supreme Court by the Republican who was elected president that year, Richard Nixon. As the man who became Nixon’s first vice president, Spiro Agnew, stirred more and more controversy, Brooke was frequently mentioned as a potential replacement for Agnew on the 1972 Republican ticket. The top Republican in the US Senate, Pennsylvania’s Hugh Scott, told reporters that Brooke “would be an asset to the G.O.P. national ticket.” In October of 1971, Time magazine highlighted the “Brooke Talk” and speculated that adding the senator to the ticket might help Nixon and the Republicans to renew the party’s appeal to African-American and young voters. In any scenario that made Brooke Nixon’s second in command—as a member of the 1968 and 1972 Republican tickets, as a replacement for Agnew on the 1972 ticket, or after Agnew’s 1973 resignation perhaps as an appointee to the nation’s number-two position—the Massachusetts senator would have been the first African-American vice president. And, upon Nixon’s resignation in 1974, Brooke would have been positioned to become the first African-American president. Of course, Brooke did not get the nomination or the appointment. But he remained the subject of vice presidential speculation. When Ford replaced Nixon and had to name a new vice president, the Rev. Jesse Jackson organized a national campaign to urge the selection of Brooke. And Oregon Senator Mark Hatfield, a fellow liberal Republican, publicly urged Ford to consider Brooke. The man Brooke nominated for the presidency at the 1968 Republican National Convention, Nelson Rockefeller, got the nod from Ford in 1974. But, as it became increasingly clear that Rockefeller would not be on the 1976 ticket as Ford’s running mate the Council of 100, a group of prominent African-American Republicans, launched a national campaign to promote Brooke—an effort that drew considerable media attention. Ultimately, after facing a tough challenge from Ronald Reagan and the Republican right for the party’s nomination, Ford opted for a conservative firebrand, Kansas Senator Bob Dole. The Ford-Dole ticket narrowly lost to the Democratic ticket led by Jimmy Carter and Walter Mondale. Carter swept the south that year, while Ford won states such as California, Oregon, Washington, Michigan, New Jersey and Vermont. And if the Republican ticket had shifted barely 25,000 votes in the states of Ohio and Wisconsin, the Electoral College would have tipped to Ford. With Brooke, as opposed to Dole, on the ticket, might the Republicans have picked up the needed votes in the African-American precincts of Cleveland and Milwaukee? After all, Brooke had a track record of getting Democratic voters to cross party lines and back him—in 1964, when Democrat Lyndon Johnson swept Massachusetts, Brooke (who refused to back Barry Goldwater) won reelection as the state’s Republican attorney general by almost 800,000 votes; and, in 1972, when Democrat George McGovern won Massachusetts by more than 200,000 votes, Republican Brooke was reelected to the Senate by almost 700,000 votes. Of course, running Brooke instead of Dole in the number-two position on the 1976 GOP ticket might have tipped the balance in a number of states, and in a number of directions. But had a Ford-Brooke ticket prevailed, there is good reason to believe that the win would have strengthened the moderate and liberal wings of the Republican Party as they headed toward the certain battles of the future with the Reaganites on the right. Even if the ticket had been defeated, it is quite possible that Brooke would have been considered as a 1980 presidential candidate. The prospect that the Republican Party might have witnessed a more robust ideological struggle in the 1980s and 1990s, and that it might have competed far more seriously and effectively for the votes of minorities, moderates and liberals, offers a reminder that the Republican Party did not necessarily have to evolve into the right-wing vehicle that it is today. There are never guarantees in politics, but there are possibilities—and the late senator from Massachusetts believed in the possibility that the “Party of Lincoln” could remain true to its heritage. Brooke tossed the eviction notice aside in 1966 and made history. He continued throughout his life to work to steer the Republican Party to the left as opposed to the right. He decried the party’s “Southern strategy” courtship of segregationist Democrats as “not just morally wrong, but politically wrong.” And he counseled that the conservative “programs and political philosophy that presently controls the Republican Party” were a barrier to attracting the votes of African-Americans and young people. 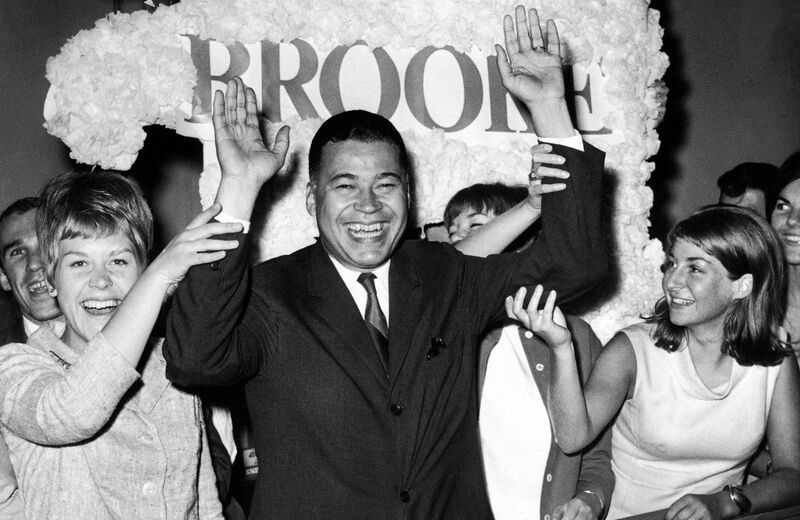 As time went on, he got fewer and fewer takers for that argument, even though his own record proved his point—and even though, with just a few twists of history, Edward Brooke might have transformed his party and his country in even more dramatic ways.